Blockpath is the only crypto tax prep tool that performs 100% inside your browser. All your exchange trade data is sourced directly from the exchange to your browser. Calculations are done in your browser. None of your information ever touches Blockpath's servers. We don't like limits. That's why Blockpath does not increase pricing for users with more trades. We couldn't do it anyways, Blockpath can never see how many trades are loaded into your browser! Our tax prep is designed for the average user that simply wants standard FIFO rules applied, privacy maintained, no annoying limits on number of trades, all done at an affordable price. Sync exchange trade history directly from exchanges using your API key. Your browser talks directly with the exchange, so Blockpath never sees your trade history. 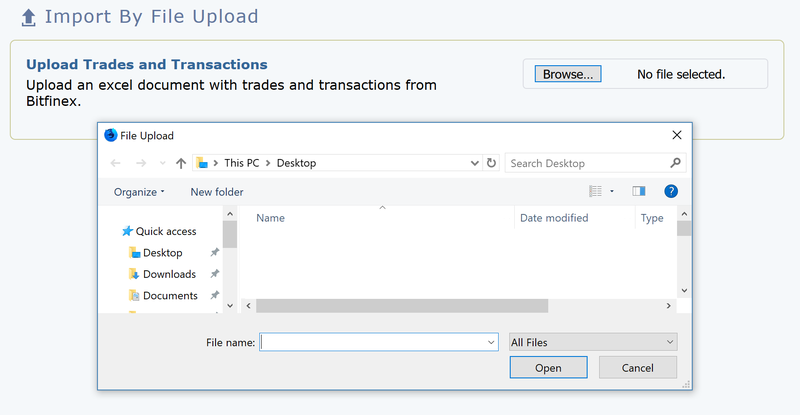 Alternatively, you can upload trade history into your browser from an Excel spreadsheet document. Once again, your browser loads and parses the spreadsheet directly, your information never goes to Blockpath's servers. On-chain Bitcoin transactions can also be considered for tax events. Whenever you receive Bitcoin as income from customers or mining, and when you send Bitcoins, such as from purchasing goods, our tool automatically matches this data with your exchange trade history to calculate your taxes correctly. Trading one crypto for another (ex: ETH/BTC market) is a taxable event. Blockpath handles these correctly by breaking them into 2 separate fiat trades, and handles all the exchange rate conversions for you. We will print your results directly onto the IRS 8949 form, with short term trades, long term trades, and page summaries all filled out for you. The PDF is generated directly inside your browser for maximum privacy. Alternatively, export your results into an .xlxs spreadsheet so you can handle the data however you choose. Again, the spreadsheet is generated directly inside your browser for maximum privacy. Your Tax Report Finished Correctly. Get access to all of Blockpath's accounting tools and have your crypto tax report finished - fast. © Blockpath LLC All rights reserved. π Rendered by PID 26312 on ip-10-0-0-43 at 2019-04-22 12:16:30.161567+00:00 running f838d3f .